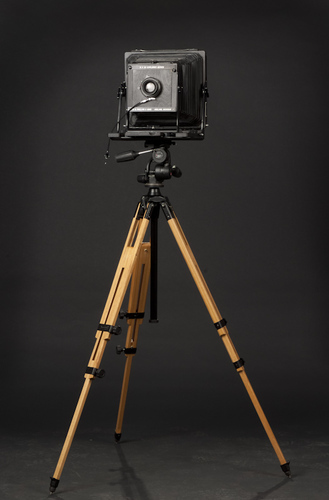 PHILLIPS EXPLORER: "I use an 8 X 10 inch large format field camera. The Phillips Explorer is a numbered, horizontal view camera custom made for me in 1994 by Richard Phillips. My primary lens is a Schneider 240 mm G-Claron copy lens. My preferred tripod for this camera is a Berlebach Report 8023 Series with centre post. I also use a Manfrotto Quick Release OO8RCA Series three-way head to hold the camera stable. I use F Stop Gear, Loka Series, to transport the camera and accessory equipment." 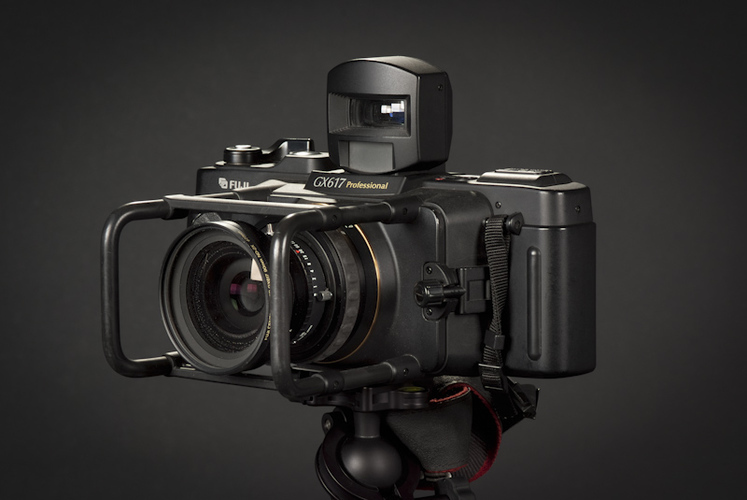 FUJI GX 617: "The newer version Fuji is considered to be truly panoramic, with a 3:1 aspect. It is a 6 X 17 cm (2 1/4 X 3 1/4 inch negative) which is medium format using four exposures developed on 120 film. I use a 90 mm interchangeable lens with separate optical viewfinder specific to the lens. Only three lenses exist for this camera. The 180 and 300 mm lenses are often available on ebay. I use a Mountaineer Series Gitzo tripod with no centre post and an Acratech quick-release ball head with a Really Right Stuff camera plate specific to the Fuji camera." HORSEMAN 612: "Not pictured here, the Horseman is not considered a true panoramic camera but is very wide angle depending on the lenses used. It is a 6 X 12 cm (2 1/4 X 2 3/4 inch negative) which is medium format using six exposures on 120 film. I use a Rodenstock 55 mm lens with its specific optical viewfinder." FILM: "I use Ilford HP5 in 120 roll film and 8 X 10 inch sheet film -- 25 sheets per box. My PMK (Pyro) developer is adjusted for my images. Exposures are made according to a zone system modified for my vision." ACCESSORIES: "Pentax digital spot meter; Pentax 5 X power Loupe; desktop version of Quiet Works Black Jacket; hybrid design for dark cloth used on large format camera, which is wind and water-proof and attached to the camera with a draw-string (it can be used as a hoodie); Harrison changing bag of the original size; Lowepro equipment bags."